Zebus are well adapted to hot climates, and they are used as draught animals, as well as for their meat, milk, hides – and even their dung – in some parts of the world. Zebu are often crossed with the other main species of cattle, Bos taurus, particularly for meat production, giving the benefits of hybrid vigour with increased heat and parasite tolerance. Zebu cattle were introduced into New Zealand in the early part of the twentieth century, but as zoo animals rather than as farm livestock. Two to three thousand years ago, a group of Zebu arrived in Ceylon or Shri Lanka, and have bred unchanged since. 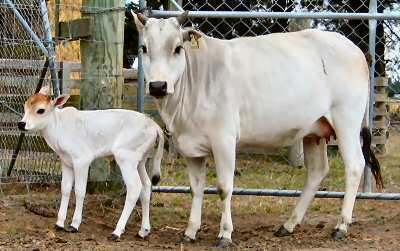 They naturally became a very small breed, and earned the Hindu name Nadudana, or small cow. Heights range from 107 centimetres to below 90 centimetres. Some were exported to North America in the 1920s, and most of the few animals in the rest of the world are derived from them. Their export is now prohibited, but they are threatened at home by genetic contamination from imported breeds. Nineteen were imported into Australia in 1995, and four into New Zealand in 2009. They are very good converters of food into high class meat, and the bull’s hump which is made of muscle, is considered a delicacy. World wide they are critically endangered. Currently both purebred and crossbred animals are being bred in Canterbury in small numbers. * Sometimes referred to as Bos primigenius indicus or Bos taurus indicus.